Bringing together a body of prints, video, sculpture and publications, Carlin’s solo show First… Next… Then… Finally… initiates a systematic blurring of the boundaries between information, noise and feedback; locating the present as being caught somewhere between the digital world and the tangible spaces of ‘real life’. 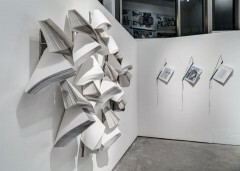 Through a methodical manipulation of information, Carlin points towards the expanding and constantly fluctuating positions available for us to occupy within a communicative set-up, and a strong sense of the physicality of positioning oneself in order to look, read and draw meaning from seemingly disparate fragments of everyday experience. 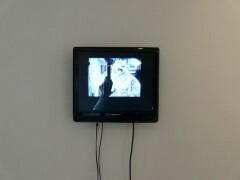 In the upstairs space, images captured by scanning a TV screen while flicking between 25 channels over a concentrated period of time are arranged to form a large print – Screenscans Havana 14’30” – that both facilitates and describes this performative exercise in the reduction of signals and narratives into one consistent image. Faces appear as distorted reflections of themselves that fade in and out of lines generated by the gaps in the process used to capture them; thus reinforcing the notion that this continual loop of interceptions is as much a part of the signal as the information it attempts to transmit. 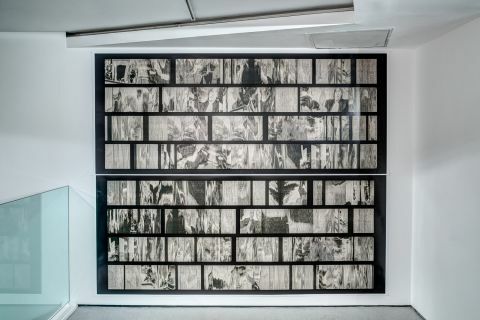 Opposite this print is displayed a video of its production – Screenscans Havana – in which we see the artists hand wiping a hand-held scanner over a TV screen, treating the unrelated images depicted as part of the one, tangible surface. In the lower gallery space, a body of prints – Corrupted Images – appear as maps or abstract records of the pressures applied upon a fixed location in the city; the traces left on a stage for activity that is in constant flux. 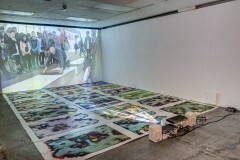 A brightly coloured set that appear like microscopic images cover a section of the floor in a recreation of the streets surface that is abstracted through the artists process of production and use of colour. Once again Carlin has chosen to project a video of the (this time public) production of this work – Performance Publishing, Market St – an act that functions as a distorted announcement to passers-by of the unnoticed physical history of the surface they are in contact with. Similarly, in Blue (sleep mode) with David Medalla, artist David Medalla – one of Carlin’s major influences – walks through the streets of Manchester at night, shining a mobile projector to highlight details of the streets, and of himself engaged in this act of ‘publishing’. One of the most interesting works – The Self-Publisher – is a series of publications compiled by Carlin doing a ‘sweep’ of local copy shops to collect photocopies that had been forgotten or discarded. A ‘table of contents’ at the front of selected publications reinforces that idea that some kind of coherent message might be conveyed from these fragments of personal interest and daily activity – a description that draws together personal emails, blank pages and extracts from publications including Reconsidering the Object in Art. These lists read like a poetry that has more resonance and potential than the information contained within the pages themselves. If Carlin is attempting to reduce seemingly disparate marks and information into a ‘whole’ that diminishes their individual meanings, then we might consider that attempting to read Carlin’s show as a ‘whole’ would involve re-negotiating our position as viewer in a manner that embraces an element of chance, similar to Carlin’s production processes. However, while the works formal similarities prompt the viewer to re-negotiate their own position in the gallery, they also obstruct the element of chance presented by the psychological space that Carlin’s methodical and hands-on processes of production have created. Carlin locates the meaning as sitting somewhere between process and end-result; his method of juxtaposing both process and result posing the question of whether this meaning should be accessed by reading between a set of distinct pages; or if in-fact these layers require a fast flicking-through in order to access a meaning that sits somewhere just out of view; somewhere beyond process, intention and result. The trace that remains when I leave the gallery takes the form of selected fragments rather than the whole – the contents of the contents page, David Medalla’s highlighting of words such as ‘new’ and ‘change’, and Carlin’s observation that “you might say you know an artists work when you’ve only ever seen it online”. These fragments are the lines that I feel compelled to read both between and beyond.